The TSA should be disbanded and we should go back to 100% private screeners. I am livid. Angry. Filled with rage. A few minutes ago (as of this posting, a few hours), I lost my favorite belt buckle to the TSA at Los Angeles International Airport, because – they claimed – it was a “replica” of a gun. What kind of a gun, you might ask? 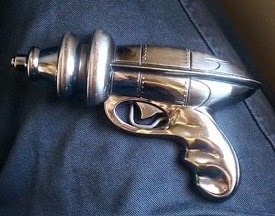 A 1950s Flash Gordon-style RAYGUN!! A fictional weapon. A child’s toy.